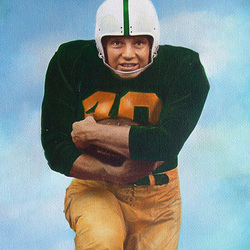 Don Bosseler was a four-year starter at fullback for the University of Miami. In his senior year, 1956, he helped the team to an 8-1-1 record, was named All-America by the Associated Press, and was MVP in the Senior Bowl. Miami placed sixth nationally, its highest ranking until the 1983 national championship season. Bosseler was recruited out of Batavia, New York, by Andy Gustafson and he joined Gustafson, his old coach, in the College Football Hall of Fame in 1990. "Being chosen for the Hall of Fame is meaningful," he said. "It is the epitome of going to college and playing the game. I am highly honored." He rushed for 1,642 yards in his four years. Then came seven years with the Washington Redskins. After his football days, he joined Prudential Bache in Miami and became a vice-president.